In my last post, I discussed the annihilation of ungodly men and women, Satan, his angels, and ultimately, of Hell itself. I stated that, if everything in Hell is to be annihilated, Hell itself would be annihilated because Hell would serve no purpose. Why would God create a Hell if there would be no one to inhabit it permanently? Consider this along with the fact that Jesus Himself states that Hell was created “for the devil and his angels” (Matt. 25:41). Nowhere in the biblical text do we read of the annihilation of the lake of fire and brimstone, nor do we read of the annihilation of Hell. Fudge may claim that annihilationism is “grounded firmly in Scripture” (see “Some Biblical Details That Inspire Change,” from The Fire That Consumes), but where is the annihilation of the ungodly, Satan, demons, false prophet, beast, and Hell itself found in the Scriptures? And if it is not found there, nor is there a biblical inference we can make regarding it, how then can we trade in the traditionalist view regarding Hell? Upon studying this subject matter, I have come to learn that many individuals think that “the grass is green on the other side” of theology until they search out these matters...then, they maintain little desire to look across the green grass over to the other side, ever again. Today’s post will focus on the word anathema in Galatians 1:8-9 as quoted above. What does the word anathema mean in this context? What does the word anathema mean in John 3:18? “The word [anathema] literally means something set up or laid by to be kept, as a votive offering might be hung on a temple wall after being devoted to a god. 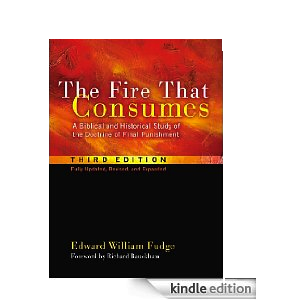 Because offerings devoted to the true God were commonly burnt in their entirety or otherwise destroyed, the word in biblical usage signifies something ‘accursed’ or doomed to destruction” (Edward William Fudge, “Galatians and Corinthians: Exposition, Galatians 1:8-9,” from The Fire That Consumes: A Biblical and Historical Study of the Doctrine of Final Punishment, Third Edition. Eugene: Cascade Books, 2011). The word anathema means “destruction,” a word that Fudge also studies in the biblical text to argue for annihilationism. In context, the word often referred to objects, offerings devoted to God that were burned when offered on an altar. In the context of Galatians 1, however, the word refers to “he,” a person who preaches or teaches a different gospel than what Paul and his companions preached. I will ask this again, as I’ve asked it in earlier posts of this series: can we really say that people are destroyed in the same way that objects are destroyed? For those who have never thought about this question, let me explain something here: the words “anathema” and “destruction” will be interpreted in one of two ways: (1) the words will mean the same for both objects and persons, or (2) the words will mean different things for the two distinct groups of objects and persons. And where one ends up on this question is a matter of the philosophy of language. Now, does this mean that theology does not play a role? Au contraire, I think it does! As I’ve shown in my post, “Lost in the Fall: The Image of God in the Book of Genesis” (August 2011), the image of God in man is what preserves the sanctity of human life. In fact, it is the image of God in Genesis 9:6 (post-flood) that serves as the reason why humans cannot murder one another. Humans are, however, allowed to kill the animals for food post-flood, but not each other. Why? Because humans bear the image of the divine God. It is this same image that preserves the sanctity of human life that annihilationists will deny still exists within man today. “The Septuagint [LXX] had ordinarily used anathema as the Greek translation of the Hebrew herem, the usual term for something ‘devoted’ to God and therefore, under ordinary circumstances, to be totally destroyed. It is used of the Canaanites whom God tells Israel to ‘totally destroy’ and whom they do ‘completely destroy’ (Num 21:2-3)...the site of this destruction is called Horman (from herem), that the Greek text gives as Anathema...When the Canaanite spoils are ‘set apart for destruction,’ the Septuagint uses anathema (Deut 7:26). The most famous incident involved Achan and Jericho. The city and all its spoils were anathema---‘devoted to destruction’—and so would be any Israelite who took from its spoils for himself (Josh 6:17-18; 7:12)” (“Septuagint/Old Testament Background,” from The Fire That Consumes). “Death is lack of relationship with God. In this [death], men and women differ from the animals, who share their earthly origin and gift of life” (“Life In Relation to God: Human Death,” from The Fire That Consumes, brackets mine). The death of human beings is qualitatively different from the death of animals (see my post titled “Qualitatively Different,” from August 2011). If this is so, how much more so must mankind differ from objects or possessions? This lesser-to-greater argument makes sense when one considers that animals are qualitatively superior to objects. It is this philosophy (provided for us from the opening pages of Genesis) that should complement our theology. If we have an incorrect view of man from the Scriptures, our philosophy of man will stray from the truth. Fudge exposes the reader to his own view here. “No one chortled that Achan was not literally annihilated” tells us all we need to know. Fudge believes that when the text says, “And all Israel stoned them [Achan and his family] with stones, and they burned them with fire after they had stoned them with stones” (Joshua 7:25b),” the text is in fact confirming the doctrine of annihilationism. But what do we see here? Nothing to do with annihilationism! The text doesn’t even so much as provide a hint that annihilationism is the action here. Rather, what we are told is that Achan and his family are killed by stones and then their bodies are burned. To be brief, Achan and his family are cremated, not annihilated. In regards to the immortality/mortality of the soul, the text remains neutral---and silent. Neither the traditionalist nor the annihilationist can use Joshua 7:25 to make their case. “This is the word’s [anathema] meaning throughout the Scriptures. Because Paul refers to a punishment of the age to come, we need not automatically assign anathema a meaning it has never had before. The method of God’s punishment will surely be different, but the meaning of it will be the same. If even an angel from heaven preaches a different gospel, Paul says he comes under this sentence. He is anathema---herem---devoted to utter destruction” (“Septuagint/Old Testament Background,” from The Fire That Consumes). But why must the word maintain the same meaning throughout the Scriptures? As I’ve stated in my posts on the philosophy of language this past month, a word can be the same word in two places of Scripture but have two different meanings, depending on context. This is the problem with the annihilationist interpretation: it assumes that the word means the same thing, no matter the context. This is why, for Fudge, anathema means “annihilate,” whether it pertains to possessions of war or to people. This assumes, however, that man is equivalent to the objects of war, the rocks, the rivers, and the trees. But did not Fudge say that man’s death is qualitatively different from that of the animals? If man has a different essence (and different death) than the animals, how can his destruction be of the same nature as that of spoils of war, of things, of possessions, of objects? To conclude that the destruction of man and the destruction of gold and silver are the same is to contradict Fudge’s own statement about the different nature of man’s death from that of the animal kingdom. I will conclude by saying that Fudge’s own words contradict his earlier words. How can man’s destruction be the equivalent of the annihilation of property when man and object have distinct essences? It is the distinctions of essence that dictate the differences in punishment. Achan and his family, we are told from Joshua 7, were killed with stones and then burned. This is physical death, but the eternal death is of a different nature than the physical one. Noah’s day is compared to the day of the Lord’s return (see Matthew 24:37-41), but the second death will not be drowning by water. Instead, the second death will be of an eternal nature, a death involving the soul, a death that will give way to eternal torment in body and mind. Cooling the tongue will be the least of troubles in the minds of those who enter forever the home of the devil and his angels.